PHOTO BY JILL GOSCHE The Ramirez and Hill families stand in their home that is under construction at 50 W. CR 6. Pictured are Anthony Ramirez (clockwise, from top left), Heidi Ramirez, Enola Ramirez, Joni Hill, Parker Hill, Ariana Ramirez, Elijah Ramirez and Hezekiah Ramirez. In January, five fire departments responded to a fire that destroyed the home at 50 W. CR 6 and most of its contents. 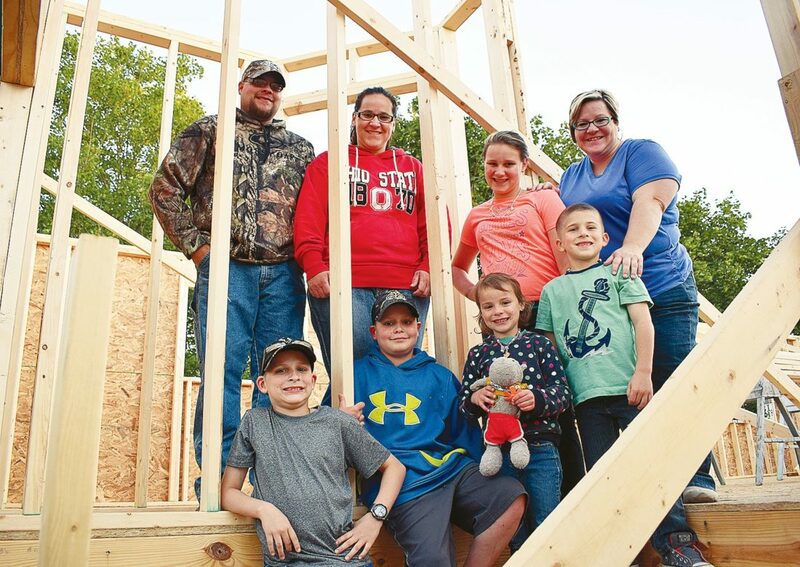 The owners, Heidi and Anthony Ramirez, and their children, Enola, 11, Hezekiah and Elijah, 10 year-old twins, and Ariana, 5, along with Heidi’s sister, Joni Hill, and Joni’s son, Parker Hill, 5, all were displaced. The Ramirez family had lived in the home since October 2012. Walls and beams are in place for a new raised ranch home on the same site. “(We’re) finally allowing ourselves to hope,” Joni said. The family is eyeing a possible move-in date in the middle of September. “It’s already gone so fast. … It’s cool to see the walls up, though,” Heidi said. The family lost 11 animals — five cats, three guinea pigs, a lizard, a rabbit and a dog — in the fire. Heidi said so many people say they’re just animals, but Jasper, her dog, was older than Enola. “He would’ve been 13 this year,” she said. The family stayed in a hotel for two weeks and has been staying in a rental house in Tiffin. “Those first three weeks were so exhausting,” Heidi said. The family felt an outpouring of support after the fire. Heidi said people were amazing, and the family members don’t know how they ever could thank them. The family received clothing, food, freezers and gift cards. “We’re still using gift cards,” Joni said. Mohawk Local School District teachers asked if they could take Enola shopping for items such as clothes and shoes, people transported the children between school and the hotel and paid for Ariana and Parker to attend Wenner-Galbraith Preschool, and a friend’s child brought toys out of his toy box. “We were so overwhelmed with people’s donations and giving that we didn’t really have a lot of time to be focused on what we lost,” Joni said. Plans for the new house have been in motion since March, and the house’s foundation was saved. The upper level of the new home includes a bathroom, bedrooms, a living room and a kitchen. The master bedroom, a utility room, another bathroom and living room, and an office are downstairs. “This (office) is a new thing for us,” Heidi said. Heidi said the family wanted to see the progress it now is seeing. “I think it’s good for the kids,” she said.